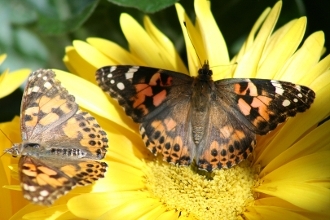 What is the difference between a butterfly and a moth? Where do insects spend the winter? How do spiders eat? Butterfly life stages are displayed, along with a selection of other safe and friendly "creepy crawlies" including hissing cockroaches, tarantulas, scorpions and other backyard bugs and surprises. We'll explore the diversity and diffrences between critters (arachnids, insects, and more), wild verses pet animals, and debunk some common myths about our garden guardians. Educational, lively and entertaining. Amaze your students with a once-in-a-lifetime experience they'll never forget! This is an interactive, live animal learning experience with lots of time for questions - and handling! You are welcome to take as many pictures as you like at no extra cost. A fast-paced, exciting, and high-impact class to really wow your students. Program appropriate for ages 3+. Our presenters are trained professionals and will adapt their syllabus to your students. Curriculum Programming Guide: Grade 1, "Needs of Animals and Plants," Grade 2 "Small Crawling and Flying," Grade 3 "Animal Life Cycles."